Now that the weather is finally starting to cool down, I think it's time to get ready for fall! Here's a list of my fall must-have accessories. Enjoy. First up is this gray nail polish from OPI. It from their Touring America Collection and is called French Quarter for Your Thoughts. I just can't seem to get enough of gray, even on my nails. And this shade is perfect for fall. 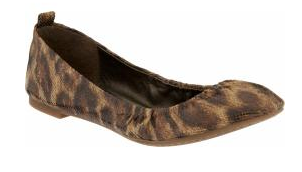 Also from Banana, we have these leopard flats (called Anna by BR). Yes, that's right folks. I found the new pair of leopard flats I was searching for here. 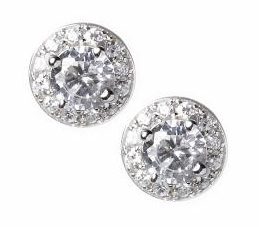 These babies are priced at $89.00, but I got mine during another promotion for 30% off. Well worth it! Leopard is great because it goes with every color-black, brown, red, green, blue--you name it. These are definitely a must-have. And oh-so comfortable (the padding has memory foam)! And last but not least, I bring to you an item by one of my favorites in fashion biz, Michael Kors. This man knows how to do a watch and do it right (three of the other watches I own are by him as well). 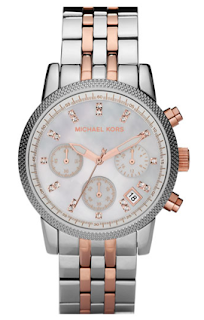 So naturally when it was time for a new silver watch, he was my man. And this is the one I brought home. I love the mix of the steel and rose gold and the little sparkle of the crystals. I am usually found sporting gold jewelry, but ever since I've gotten this one, I haven't wanted to take it off. Tomorrow I'm going to show you all of the crazy deals I got at Michael's today!